In economics, a recession is a contraction in the business cycle. There is a decline in economic activity, which we measure using several macroeconomic indicators. In recessions, the following factors drop: GDP (gross domestic product), investment spending, household income, inflation, and business profits. There is also an increase in bankruptcies and the unemployment rate. An adverse demand shock, an external trade shock, an economic bubble burst, or a financial crisis are possible causes of recessions. Economists say that if we do nothing to address banks’ reluctance to lend money, recessions get worse or last longer. Keynesian economists say that if there is a recession, the government should intervene to boost economic activity. Otherwise, the economy can remain flat and fragile for a long time. When governments detect signs of a slowdown, they usually start off by increasing the money supply and decreasing taxation. They may also boost government spending. There are various definitions of what recessions are. Some economists believe that they occur when there has been a 1.5% rise in unemployment in the past year. In the European Union defines the term as two successive quarters of GDP contraction. This definition is, in fact, gaining traction across the world. If a recession continues for more than three years, it becomes a depression. There are no definite ways of accurately predicting when recessions occur. However, there are few indicators that economists measure. A three-month drop in the employment rate. Index of Leading (Economic) Indicators. Assets substantially drop in price. Property prices and the value of financial assets, especially, are more likely to point to potential economic consequences. In addition to the indicators above, severe stock market declines may precede recessions. A double-dip recession is one that experiences recovery and then dips straight back into another recession. It occurs when an initial recovery fails. In other words, the recovery does not manage to gain back total economic output. The economy subsequently slides back into decline. The Great Recession followed the global financial crisis of 2007/8 and the subprime mortgage crisis of 2007-2009. In the 1930s, many countries’ economies deteriorated during the Great Depression. 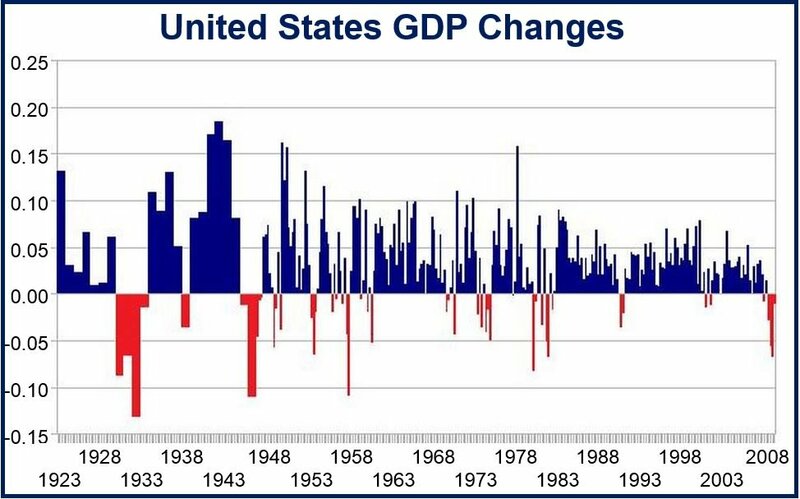 From 1929 to 1932, global GDP shrank by 15%. Depressions are much more severe and longer-lasting than recessions. When a country is in a recession, the central bank may try to kick-start the economy by injection money into the private banking system. However, sometimes the measure does not work. We call this situation a liquidity trap. Even though banks offer loans at very low interest rates, people still want to hoard cash. In fact, during a liquidity trap, very few people want to borrow or spend more. When a recession affects many countries in different parts of the world, we call it a Global Recession. Economists use four different capital letters to describe recessions. We also call them U-shaped recoveries. There is a steep decline in economic activity, and then a long trough. A slow recovery follows. On a graph, the economy follows a path that looks like the letter ‘U,’ hence the name. We also call them V-shaped recoveries. The economy experiences a sharp and brief decline. Then, there is a clear trough that does not last long. Finally, there is a strong recovery. The majority of recessions follow this ‘V’ shape. We also call them W-shaped recoveries, double-dip recoveries, or double-dip recessions. First, the economy slides into a recession and then recovers. However, it subsequently slips into another recession. Finally, it recovers. Economists say that these are the ultimate nightmare. They start with an economic downturn, i.e., a recession. Then, the economy hits rock bottom. However, like the letter ‘L,’ it stays there. In other words, there is no recovery. Sometimes, after the major bubble bursts, there is an echo bubble. This is a premature recovery that does not last long. The echo bubble also bursts, often bringing with it an even worse recession. Video – What is a recession?